9/11, which especially pissed me because we had lost one our own–a brilliant, promising young nephew. 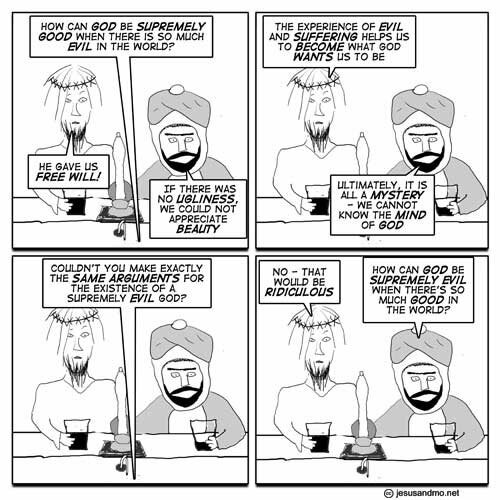 The comic is funny — but the sophistic responses to the God of Eth are even funnier! It’s always the old Poe problem — how can you parody the absurdity of theistic beliefs? It’s like Tina Fey and Palin — all Tina does is repeat the transcripts of Palin, because there is simply nothing funnier than the reality. Yes, God promotes starvation in the thirld-world so that the first world would appreciate being well fed. Is it just me or does it always look as though were giving Jesus a “helping” hand under the bar??????? Not that there is anything wrong with that! Quick typo correction: 3rd panel, change “an supremely” to “a supremely”. Okay, so if God gives us free will and allows bad stuff to happen (even though he could foresee and prevent it), then what good is he? Why bother wasting time telling him how great he is, if he’s going to just sit around and let stuff happen anyway? If we’re going to get blown up/flooded out/starved/etc., why not just have fun until it happens? Isaiah 45:7 Â I form the light, and create darkness: I make peace, and create evil: I the LORD do all these things. So, there you have it. Yahweh is supremely good and supremely evil at the same time. Same thing with “perfection.” Perfectly good and perfectly evil. A regular walking(?) contradiction. 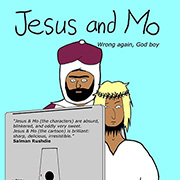 From the horses other end: Yahweh can therefore play both parts, the good cop and the bad cop? I read this and immediately thought, ‘Stephen Law’. Keep up the good philosophical work Author! Jerry W., maybe Yahweh doesn’t have a back end, and that’s what makes him so angry. Naw. All the crap’s gotta come from somewhere. Are the actions of Yahweh the right because Yahweh does them, or does Yahweh do them because they are the right thing to do? Argument: Humans do evil because they are not perfect. They are flawed creatures. Counter argument: If a widget machine is making widgets, and the widgets are flawed, the fault lies not in the widgets, but in the widget machine. Can someone come up with an argument proving the existence of â€˜Godâ€™ that CANNOT also be used to prove the existence of all the Greek, Roman, Egyptian and Norse gods, Santa Clause, and the Tooth Fairy? He knows, cares but can’t act. Or, he knows, could act but doesn’t care. Or, he would care, would act but doesn’t know. Or he doesn’t know, wouldn’t care and could’nt act if he wanted to. Which God would you rather worship? I love the “the same arguments could be made of an evil god”. Priceless! Exactly what the Gnostic heretics argued. And the loely Christians had them all tortured to death. For their own good, of course. That’s something that bothered me for years before I realized all religions are made up. Either the god can’t stop great evil or he can and chooses not too. You can’t tell me that allowing someone to exercise free will is more important than protecting innocent lives. Roman Catholics believe that the Blessed Virgin Mary had free will but was given the gift of freely choosing never to sin. Presumably the rest of us could have been given that gift. If god wants us to be or do something, he is desiring a different state of the world, in which case, he is not perfect. If he desires the world to be different from how it is, eg, by me NOT throwing a baby down the well every morning, then he would be improved by that condition being fulfilled, ie, he is necessarily imperfect until that condition has been met. The idea of a â€˜perfectâ€™ being â€˜wantingâ€™ something is self-contradictory. Great discussion! One more thing: Yahweh was supposed to have changed his mind that he “made man,” and thus decided to kill them all via flood (ala Noah, Utnapishtim, etc). This question, here, is: How can an omniscient god change his/her mind? against god’s will? Hmm, I’ll have to try that one next time I get arrested . . . 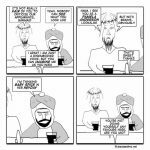 This is one of the best religion cartoons I’ve seen in a while. Indeed Hobbes. Before you even get to the ‘Problem of evil’, I can’t see any way logically a being could be both omniscient and omnipotent. great cartoon. heckuva job, author. None of the gods ever existed except in the minds of the fearful. I know that if G_d’s out there He/She/It would hate me for this but the whole God=good thing was mostly intended to flatter G_d (and yes I’ve temporarily taken up the whole Jewish editing-out-the-vowels custom). The fact is that most people can’t except an Allmighty who like us embodies both good and evil, which is really not that complicated. I saw one Christian website argue that G_ d= Good means “Good by His own standards for Himself” which can mean anything. And since you’ve already got a “Ben” I’ll call myself Ben 2. Um, does anyone actually believe this argument? I think everyone has the capacity to evaluate the good from the better, and the beautiful to the beautifuller. And, where was the free will involved of tragedies like the tsunami, the earthquakes, infant mortality, etc. ?